Well, I've said it before and now I'll say it again: My husband's going to kill me. Not because he's a homicidal maniac (not that I know of), but because I am once again pining for a new game system (the system in this case being the PSP). The recently released Gurumin: A Monstrous Adventure gave me the first shove in the direction of Sony's under-loved portable, then the remakes of Final Fantasy I, Final Fantasy Tactics and Disgaea gave me another little push. 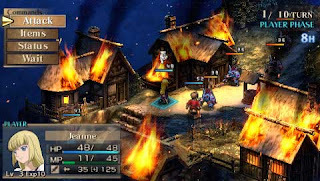 Today on Siliconera.com I read that two more examples of RPG goodness will be showing up on the U.S. PSP scene soon enough: XSeed's Brave Story: New Traveler and Level 5's Jeanne D’Arc. The latter looks especially appealing, what with its cell-shaded graphics and Tactics-esque game play. The next thing you know, Sony will start unleashing some monsters for the PS3--then I'll be in especially big trouble! DS Crystal Chronicles: Lookin' good! Could the DS beat them all?